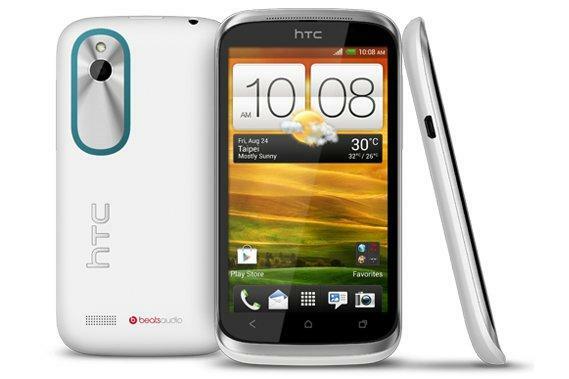 Optus will exclusively sell the HTC Desire X smartphone in Australia, it was announced today. The Desire X is HTC's attempt to bring the style of its higher-end One X and One S handsets to a more affordable device. The HTC Desire X will sell for $0 upfront on a $35 Optus plan over 24 months but will also be available for $299 as a pre-paid mobile. The HTC Desire X comes with a 4in touchscreen, making it significantly larger than most similarly priced pre-paid smartphones on the market in Australia. "We are committed to offering strong alternatives to Australian consumers looking for a smartphone to suit their individual lifestyles," said HTC's Australian and New Zealand Country Manager, Ben Hodgson. "The HTC Desire X not only looks and sounds great, but is a premium, compact device that provides a super-fast, highly personal mobile experience at a great price." The HTC Desire X morphs some design features from the One range into a device that's both smaller and significantly cheaper. It's just 9.69mm thick and features a similar shape and style to more expensive models in the Taiwanese company's range. The HTC Desire X comes with the Beats Audio profile that aims to enhance sound quality, has a 5-megapixel camera and has a microSD card to expand the 4GB of internal memory. However, it lacks a front-facing camera for portrait photos and video calls and the rear camera can't record HD video. The HTC Desire X is powered by a 1GHz dual-core Snapdragon processor, has 768MB of RAM and will ship with the 4.0 Ice Cream Sandwich version of Google's Android operating system with HTC's traditional Sense UI overlay on top. Features of Sense include the ability to capture still images while recording video, a burst mode that will take 2.5 photos every second and 25GB of integrated Dropbox storage for two years. HTC hasn't stated if or when the Desire X will be upgraded to the latest 4.1 Jelly Bean version of Android. The HTC Desire X is available now through Optus in Australia. It will sell for $0 upfront on a $35 Optus plan over 24 months. The plan includes $200 worth of calls, unlimited SMS, 200MB of data and unlimited access to Facebook, Twitter, LinkedIn, MySpace, eBay & Foursquare services per month. The Desire X will also be available as an Optus pre-paid handset for $299.